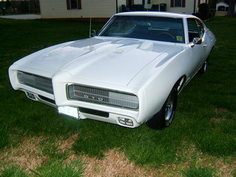 The 1970 Pontiac GTO was the pennacle of the muscle car era. 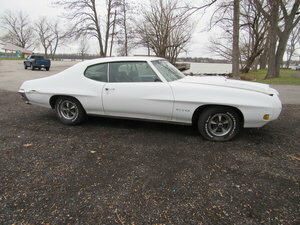 This real GTO recently finished a professional frame off restoration when it was given The Judge and Ram Air upgrades with real Ram Air IV heads, cam, intake, pistons, crank, etc. see pics for more description. It has a numbers matching 400 V8 WT block but all the RA IV parts came from one of the 627 RA IV coupes that was wrecked.The Muncie 4spd is mated to a 12 bolt 3.90 positraction rear end that also came from the donor RA IV. The Judge decals and emblems are all located in the correct spots. Loaded with features like 15x7 Rally II wheels, Rally gauges, hood tach, power steering, power disc brakes, Soft Ray tinted glass, wood steering wheel, and more. This Goat is in great shape and runs even better than it looks.